My parents visited for a week in the fall and 5 of the 7 nights we spent together we had a card game or a board game out. 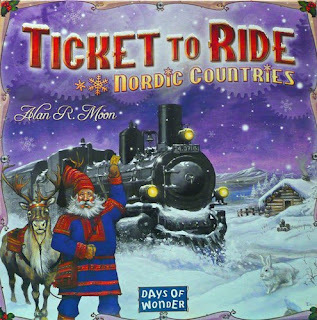 One of Mom's personal favourites, Ticket to Ride, got played repeatedly (the Nordic Countries edition that week). Mom loves TTR so much she went out and bought her own copy of the game. So I am happy to say that in two days I am off to the Dominican Republic for some well-needed R&R, thanks to a very generous Santa Claus (aka my partner). Although I plan to explore the area, swim in the Carribean, and read some trashy novels, I also hope to get some games in as well. Why not? I'm on vacation. Question is, what to bring? Dominion is outta the question as the mere thought of the 500 cards getting all mixed up makes my little heart quiver. I'm nervous enough about the flight there, let alone the thought of one of my games getting disorganized... Although, I should clarify: Dominion was a Christmas gift for Vince, so technically it is HIS game (of which he reminds me frequently). 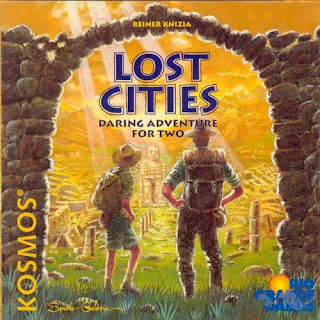 My first choice, Lost Cities (http://www.boardgamegeek.com/boardgame/50) is a classic - a tricky little game of bluffing and pushing your luck that any rummy player would enjoy. 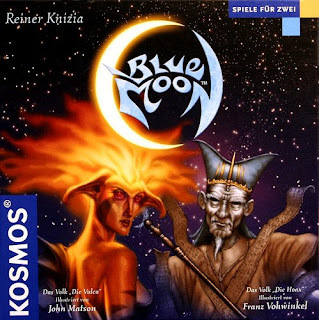 The next game, Blue Moon (http://www.boardgamegeek.com/boardgame/9446), is a new game to me and another Christmas gift. I've only played twice and quite enjoyed it, and I'm excited to plumb its depths. Interestingly, both this and Lost Cities were invented by Reiner Knizia, one of the most prolific game designers alive today. This third game is one of V's faves so I better not forget it. 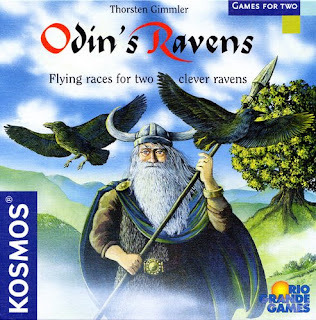 Odin's Ravens (http://www.boardgamegeek.com/boardgame/4396) is an interesting race game which allows you to rearrange the race track to speed you up or slow down your opponent. 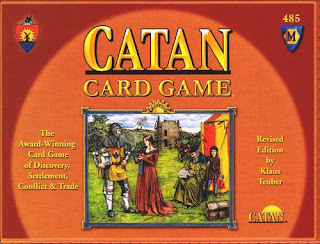 I know, I know, Settlers is an over-played piece of crap IMHO but the 2-player Catan Card Game (http://www.boardgamegeek.com/boardgame/278) is a surprisingly amusing game and one that we haven't played in a long time. 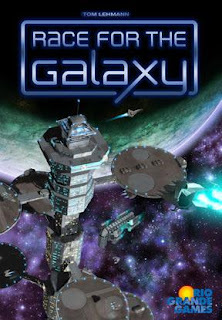 Finally, I'm gonna sneak last year's favourite Race For The Galaxy (http://www.boardgamegeek.com/boardgame/28143) into the suitcase. Vince has refused to play this since we got Dominion, and so here's the chance to revisit this brilliant game. Latest Dominion Strategy: Buying Chapel cards early to prune your deck of excess Estate cards as soon as possible and then getting rid of said Chapels with the Chapel card. So if you haven't played Dominion yet, you should. It's probably the best game of last year and the most original of the last five. It's easy to learn and play, loads of fun and frustration, and totally different each round (which only take about 30 minutes). This game has probably seen 30+ plays in the last month which is unheard of with me. We are officially obsessed and NEED MORE ACTION CARDS. 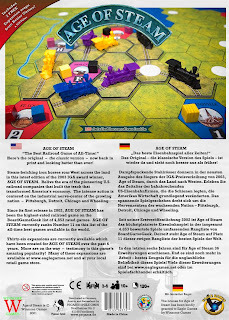 Rio Grande Games just announced two new cards in March, a new set of 25 in April or May, and 25 more in the fourth quarter. Question is, can we wait that long? So I'll readily admit that I usually lose most games we play. You'd think being the token mathematician and board game collector/obsesser, that I'd do a bit better. I like to reason it away by saying that I'm always teaching the rules and helping out new players but that only explains about half the games. Like Puerto Rico two nights ago, a game with almost no luck of which I was the only one who had played the game, and I come in last... by a lot.